The first one is from a user named “JimPlaysGames”. This for his let’s play series which he will be concluding. I like how he crops the user interface of the game to give the impression that everything is a cinematic. His voiceover is very nice and the editing is well done. From watching this trailer, it made me realize that of all the details TFB put into SC2, they even included smaller details such as stars expanding and objects on a planet’s surface blinking to show that it is active and attracts the player’s attention. This is a trailer of a recent update to Project 6014 that is also epic and shows off its HD graphics, animations and user-created ships in the melee mode. It plays a remix of the intro theme I’ve never heard before. I really need more time in my life to play this. It’s really awesome to look at and they even included HD fonts. Project 6014 is composed of talented and dedicated fans in the Star Control community. 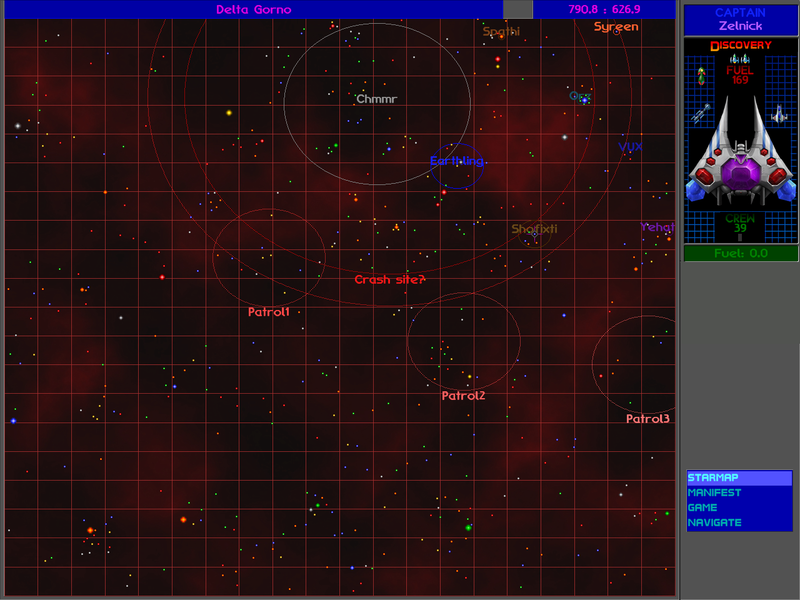 They even created a hi-res starmap for players to download. After begging for an HD-remake of SC2 for many years and trying to wrap our brains around the legal status of Star Control, it’s incredibly awesome to see that the 6014 team not only remade everything in HD, but included a new story for players to sink their teeth into. I highly recommend checking this out and I hope the news continues spreading around. Please check this out. This is a must for any Star Control fan! It may even trigger more fan-mods, which became a legacy for games such as Quake, Half-Life and Unreal. Thanks, dczanik for reminding me about this. This is a huge step towards keeping Star Control in the spotlight longer. I received an e-mail from Joe who sent me an Orz T-shirt he created. 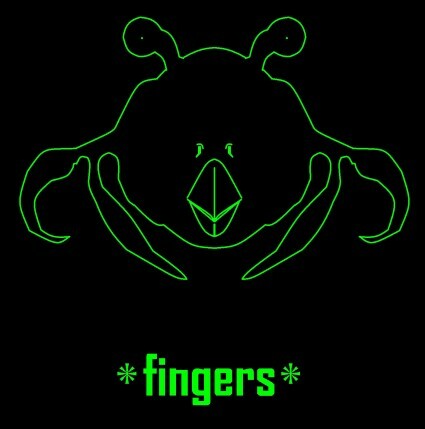 It’s got a nice outline of an Orz with the cryptic phrase “*fingers*”. The Orz really stand out in Star Control II as that race that is difficult to understand and is a valuable ally. Unfortunately, they’re the only ones who know what happened to the Androsynth and pressing them on this topic makes them “*frumple*” and will turn against the player. Their music is very soothing and is mixed in with strange sounds. It’s definitely an awesome shirt. 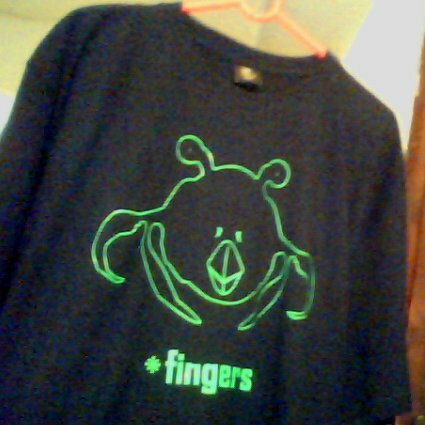 Obviously, most people wouldn’t understand *fingers* or what the Orz is, which adds to the mystery of the Orz itself. I remember seeing a forum thread a long time ago on the forums where someone made a T-shirt with all of the Star Control ships arranged in a circle with their ship name underneath each one. Fan creations are always cool stuff to check out. There are different ways to create custom shirts from images. The ways I have seen are iron-on printing paper, using a screen-printing machine or paying a company to do it for you. 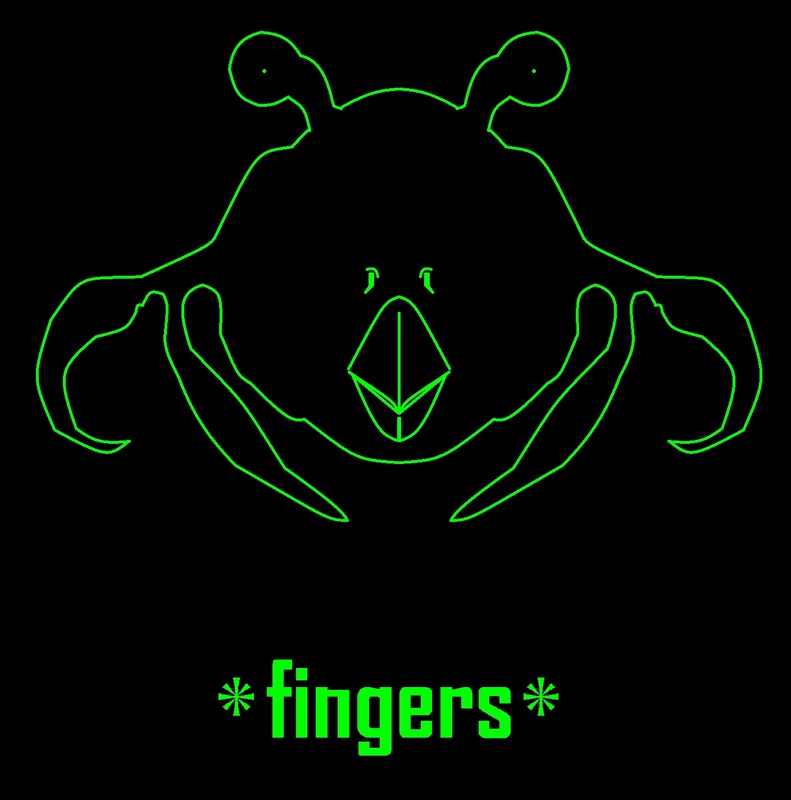 It’s awesome to see that Joe became inspired by Star Control and the fanbase and created a shirt design to show his love for the series. I’d love to create a bunch of custom shirts for myself. I just need to find that right balance of style, price, resources and time. I remember looking at an online website that specializes in this and each shirt wound up costing between $20-35; of course, each image was full color and large. This is a nice image and a great shirt, Joe. Thanks for sharing it with the world. 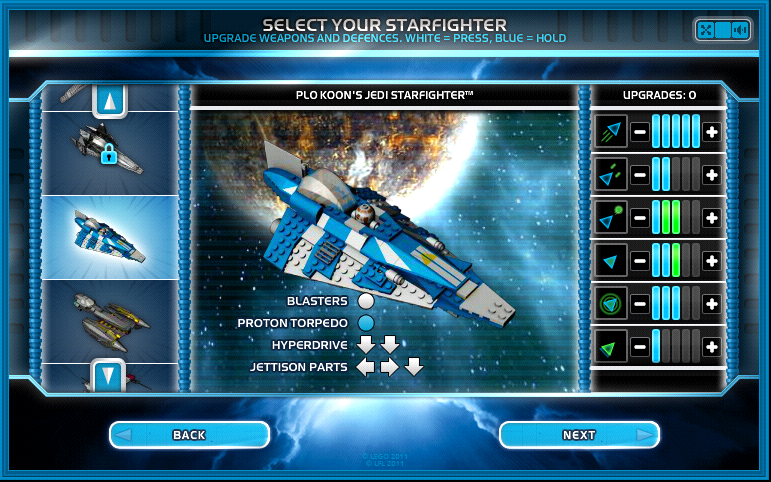 To promote the recently released Lego Star Wars III: The Clone Wars, 4T2 Multimedia Limited created a flash game that can be played in a web browser for free. 4T2 is UK agency that specializes in “creating online games and websites for kids”. It shares a few things in common with Star Control and it is definitely worth checking out. In addition to single-player, two-player is available by clicking on the X-shape with the 4 arrows on the top right of the game near the mute button. Ace Assault has been played over 10 million times. Each ship has unique stats, primary/secondary fire, and a key combination for a special ability. There are a total of 10 ships to select, 2 of which need to be unlocked with a code. It’s been a long time since I’ve played Lego Star Wars. From what I’ve seen, Lego Star Wars III has had mixed reviews and people still considered it a good game for fans of Lego Star Wars. Ace Assault is a very interesting way to promote the latest game from Traveller’s Tales; I’ve seen flash game promos before, but I think this is the first time I’ve seen a Star Control style game used to promote a popular franchise. It’s definitely superior to the flash game that Atari produced, which was developed by a small team that only had a few days to finish it. The fact it’s been played over 10 million times shows that this style of gameplay can reach a wide audience, it’s easy to understand, and people have incentive to play it more than once. I’d like to thank Pete for writing that article for GamePro and even recommending that people check out Star Control 1 and 2 on GOG.com. Thank you 4T2 for creating this small promo that has made people think about Star Control once again. What do you think? Do you think this could be the sign of more Star Control related games to come? Speaking of which, I know of a bunch of indie games I want to check out and I wish I had more time to play them in more detail. Greg Johnson is the creative genius behind games such as ToeJam & Earl and Starflight. He is also a longtime friend of Paul Reiche and he provided the voice for the Utwig in the 3DO version of Star Control II which can also be heard in the SC2 re-release, The Ur-Quan Masters. Greg formed a new studio called HumaNature Studios which has released a Facebook app called Deko-Deko Mail. It can send personalized messages to other Facebook users with a distinctive hand-drawn art style, and can be embedded in websites. HumaNature’s latest Deko-Deko release is Deko-Deko Quiz. Its design reminds me of a fortune cookie because it shows auto-generated text describing my personality based on my answers. The questions from this quiz are easy to understand, short and shows pictures as choices rather than text. For example, the user may be asked which robot represents his or her inner self. If your friends answer the same questions, answers can be compared. I have seen other apps that quiz users and compare answers with friends and this one isby far the most artsy and creative. I’m not just thinking about words; suddenly, I’m thinking about how things are being portrayed in drawings of food, robots, dinosaurs, cars, plants, space, funny hats, etc. In addition, the key currency in Deko-Deko Mail and Quiz are shared across both apps. The keys can be used for inputting more pictures into text; it’s a way of encouraging people to share the apps with a special currency. For Facebook users, this is definitely worth checking out. New quizzes are sent out each day. What do the quizzes say about your personality? ZOMG!!! UQM HD Mod Artwork by dczanik! The plushies on the right are a nod of Zarla’s art and love for the ZEX. Some people may have seen dczanik’s artwork in the UQM mod, Project 6014. While this project has just started, it’s awesome to see high-quality artwork. After all, recreating a masterpiece is no easy task. However long it takes, I hope the news spreads around and people check it out. So, check it out and take a look at his DeviantArt profile. P.S. I have increased the number of posts per page from 2 to 5. Originally, the site was slow and lowering the number of posts to load made the site faster. Hopefully, things should be stable and I might even increase the articles per page to a higher number in the future. Not only is Greg Johnson the creator of games such as ToeJam & Earl and Starflight, he is also a longtime friend of Paul Reiche. They have both contributed to each other’s games, Star Control and Starflight. Greg has created a new studio called HumaNature Studios. Their latest project is Deko-Deko Mail. It is not actually a game; it is a Facebook app that allows users to send a message to someone in the form of a flash video with a cartoon font and quirky animations. It is currently in the beta stage and more features are on the way. As of this post, the only thing that can be done is post to other people’s walls publicly. There will be a feature to send people private messages and be able to write letters with multiple images in it. They do have plans to create other Deko-Deko related products in the future. It is possible to buy Facebook credits which can be turned into keys, the currency for Deko-Deko Mail. Keep in mind, the app itself is free and the user is rewarded points whenever someone’s wall is written to and when the app is opened. For the month of March, they have donated money spent on keys towards the Japan relief effort. ToeJam & Earl are in Deko-Deko Mail. They can be searched and there are the characters from the game and the logo itself. There is also a button to request new animations. Why not request Star Control and Starflight, another game that Greg made? In conclusion, this is definitely worth checking out for any Facebook users who have been wondering what Greg Johnson and his studio has been up to during this time. The Facebook market is definitely booming and is a popular platform for casual gamers. Good luck to HumaNature Studios and their future success.